Rafael Nadal went one better than his defeat in the Abu Dhabi final last year to Andy Murray. (CNN) -- World No. 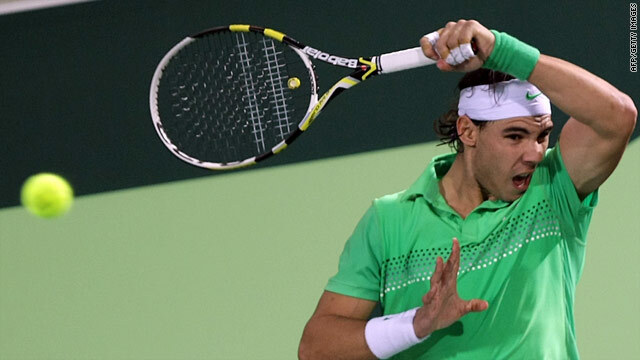 2 Rafael Nadal overcame last year's nemesis Robin Soderling to win the World Tennis Championship exhibition tournament in Abu Dhabi on Saturday. The Spaniard, whose defeat to the Swede in the French Open triggered the unraveling of his season amid injury problems, won 7-6 (7-3) 7-5 as he began his build-up to the defense of his Australian Open title in encouraging style. Soderling, who also defeated Nadal at the season-ending ATP World Tour finals in London, had come into the match buoyed by his breakthrough first victory against world No. 1 Roger Federer in the semifinals on Friday. Having taken the first set to a tie-break, Soderling fought back from 4-2 down in the second set to level at 4-4 but Nadal -- who lost to Andy Murray in the final last year -- showed no signs of the inconsistency that plagued the latter half of his 2009 campaign as he clinched victory. Earlier on Saturday, Federer claimed third place with a 6-1 7-5 victory against Spain's David Ferrer. The tournament, which is not an official ATP Tour event, also featured Russia's Nikolay Davydenko and Federer's Swiss compatriot Stanislas Wawrinka. Wawrinka replaced Jo-Wilfried Tsonga in the field after the Frenchman pulled out with a wrist injury. Federer and Nadal will next head to Doha for the opening tournament of the ATP Tour schedule, while world No. 8 Soderling will be top seed for the Chennai Open in India.